Apple is planning to hold an event on March 25, its first of 2019, according to a new report from BuzzFeed. The event will reportedly take place at the Steve Jobs Theater on the Apple Park campus. 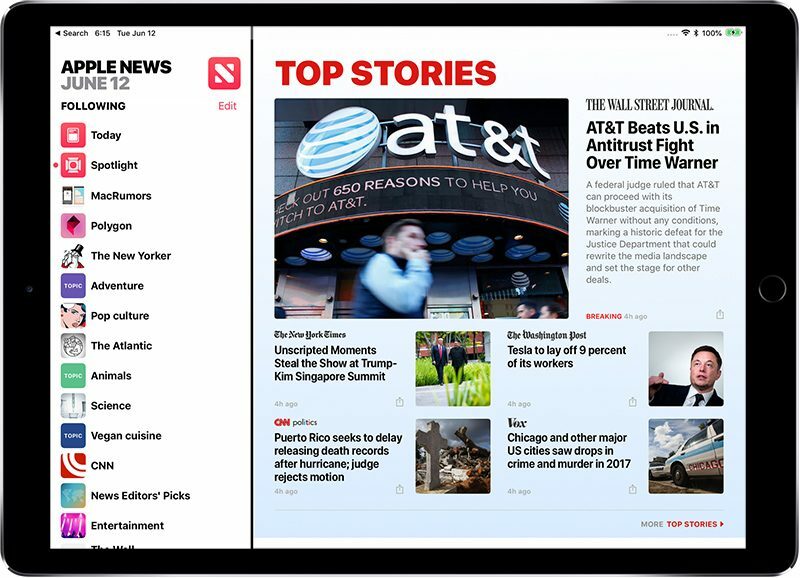 Apple will use the event to unveil its rumored news service, which will add paid subscription options to Apple News. While Apple has many products in the works that are rumored to be debuting in the spring, BuzzFeed says not to expect the company to unveil a new iPad mini or second-generation AirPods, as their appearance at the event is "unlikely." Instead, the event will be "subscription services focused," though it is unclear if it will also include details on the upcoming TV news service that Apple has in the works. That service is expected to launch as early as April, so it's certainly possible. Recent rumors suggest Apple is planning to offer a $9.99 per month subscription for Apple News that would allow users unlimited access to paywalled content on sites like The New York Times, the Washington Post, and The Wall Street Journal. Apple is, however, said to be still negotiating financial terms, as it is requesting 50 percent of revenue from the service, with the rest to be split among publications. News sites are said to be wary to enter into this deal with Apple due both to pricing issues and Apple's desire to control email addresses and credit card information. There have been rumors suggesting that Apple will bundle the news service with iCloud storage tiers and its television service, providing all-in-one Apple services package, which could mean both the news and TV services will be introduced all at once. The news subscription service could also include magazines, as Apple is said to be working on a $9.99 per month service that would offer magazine access much like the Texture app that it acquired last year. With the event reportedly focused on services, it sounds like we also won't be seeing an upgraded iPad, a new 7th-generation iPod touch, or the AirPower at the event, along with the lack of a new iPad mini and new AirPods. If March isn't the planned launch target for these items, it's not known when we might see them. Apple could plan a second spring event, though it has never done so, or opt to introduce them later in the year at WWDC. Eventless launches are also a possibility, so Apple could release these products via press release without highlighting them at an event. Apple has held events in March in 2015, 2016, and 2018, so it makes since that the company is planning a 2019 March event as well. There is always a chance that BuzzFeed is wrong and Apple will debut these new devices at the event, but the site often provides accurate information on Apple's plans. Interesting... so no new products until June WWDC and/or September’s iPhone event? We’ll see. An event dedicated to um... A new news subscription service seems underwhelming. Why does it feel like when it comes to services Apple is working backwards from the financials to a product? This seems more like somebody at Apple wondering what they can charge users a monthly fee for and then trying to come up with something. People might pay for a Netflix clone but getting them to pay $10/month for the news? Not likely. And no new publication is going to sign on if they have to give Apple 50% and get no user analytics. Crazy. An event for an app people hardly use and now we want to add paid subscription to that app you hardly use. Doubtful. I will hold judgement until I see what they have to offer but I can tell you I am grumpy about services in general at the moment. I pay for the family music plan, more storage in iCloud, Netflix, Prime, warehouse stores, TV, Internet, mobile phone service, etc. I look at my statements and its like I used to have one big expensive bundle now I have many different parts since I can pick and choose and have found my way right back where I started. In the end it is all something I can control. I can turn these off anytime I am ready to stop paying but what do you do. Ha. You just keep adding it on $10 at a time. Really hoping for an increase/adjustment of iCloud tiers. Hopefully 200gb will be moved up to 500gb for the same price. Been the same way for a number of years now. Ten dollars a month for news? That's not happening with me. I can't think of a valid reason to pay for what passes for news these days, that I currently get for free. So March 25 is the day I uninstall the news app then it sounds like..